Kuala Lumpur, 9 March 2016 – Our homes are our best investments. Understanding and anticipating your needs, Hitachi Sales (Malaysia) Sdn. Berhad. introduces a series of smart and ecologically-inspired yet luxuriously designed home appliances. “Steeped in a rich history of quality electronics, Hitachi has garnered a reputation for engineering top of the line eco-friendly products. Today’s line-up of refrigerators, washing machines, air-conditioners, vacuum cleaners, air purifiers, rice cookers and microwave ovens are no exception, all of which are the perfect combination of innovation and quality for you and your home. 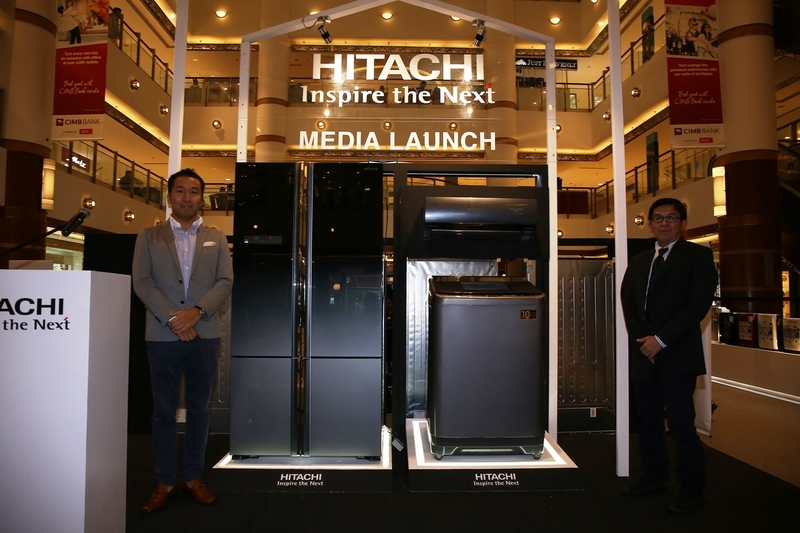 These products are designed with original Hitachi technology that we believe will contribute to society through state-of-the-art technology, aimed to bring greater convenience and enhancements to our consumers’ quality of life,” said Toshinori Kaneko, Managing Director, Hitachi Sales (Malaysia) Sdn Berhad. Designed to give you top class energy savings, the stylish French Bottom Freezer Refrigerator comes with the Hitachi Inverter and Dual Fan Cooling feature and Vacuum Insulation Panel (VIP) to ensure that your food and beverages are kept at a consistently cool temperature for optimum freshness. Get ready to host more dinner parties as it’s Easy-View Refrigerator Compartments’ super big capacity and extra wide interior lets you store large dishes and big items if you have any leftovers and one glance is all your need to know what you have stored. Keep your vegetables fresh for up for 7 days with the Aero-care Vege Compartment as it controls the air and surrounding temperature by increasing the concentration of carbon dioxide with a platinum catalyst to slow down the respiration process. A convenient feature is its Easy Twist Ice Maker located in the door of the freezer compartment that makes it easy to make and take out ice while leaving more storage space. Reach for your favorite food and beverages easily as its user-friendly height and Open-Assist Handle enables opening with little effort even when a lot of items are stored and the compartment is heavy. Available in Gradation Grey (XGR) and Glass Black (GBK), Hitachi also offers a 10 years compressor warranty for all inverter series and with its intelligent and energy saving features. Japanese design and technology at its finest, this line of refrigerators redefines freshness. Some notable mentions include Hitachi’s own technology such as the unique Vacuum Preservation technology with Photocatalyst preservation and the Antioxidation Fresh Cassette that keeps meat, fish and dairy products chilled and fresh. The innovative Aero-care Vege Zone creates an optimal environment which maintains freshness and nutrients in vegetables, giving your family a good meal each time. This series also has the Inverter and Dual Fan Cooling feature to give you consistent savings. 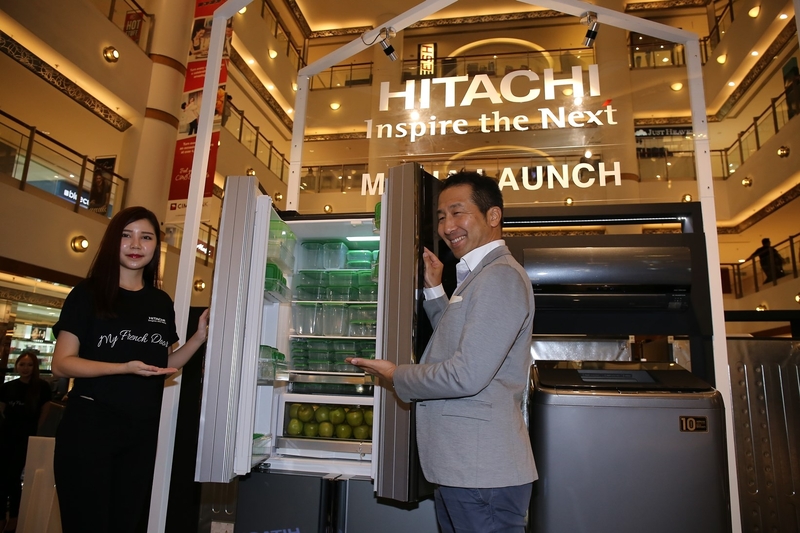 As Hitachi continues to pioneer green initiatives, unique Hitachi technology such as the Frost Recycling Cooling with a Hybrid Defrost and the flexible Vacuum Insulation Panel (VIP) effectively lower your annual household energy consumption as they enhance the refrigerator’s cooling efficiency to save more energy. With just one touch, the refrigerator doors and drawers open up automatically with the Hitachi Original Auto Doors and Drawers technology even when fully loaded. Available in four colours; the Crystal Mirror (X), Crystal Black (XT), Crystal Brown (XK) and Crystal White (XW), this line of Hitachi refrigerators with its Touch Screen Controller were designed to perfection, opening up another fresh avenue to intelligent homes. As a further guarantee and commitment to offer high quality products, Hitachi offers a 10 years compressor warranty for this refrigerator series. Hitachi’s series of eco-friendly washing machines harnesses the power of water by utilising the Ultra-Stream Wash technology. It produces powerful water circulation that thoroughly removes dirt while reducing water consumption. Ranging from 18kg to 24kg, its larger capacity allows you to wash large and thick items like curtains or sofa covers in the comfort of your home and not worry about wasting water. The new SF-240XWV model can wash loads up to 24kg at one go, definitively more energy, water and time saving compared to washing two 12kg loads in a conventional 12kg model. In addition to the larger capacity, the Powered Inverter in this series of Hitachi washing machines has a better control over the tub and pulsator rotation, adjusting according to the small or large loads for optimum energy-saving operation. This high performance series of Hitachi washing machines comes with the 3-Step Eco Sensor that detects in three steps the most optimum setting of washing conditions by determining the laundry amount and fabric type. The result is precise sensing to ensure that there is no wasted time, electricity and water. It also features the Smart Wash Program, Water Power Control, Shower Plus, Memory Options, Tangle-Free Finish mode and another 11 washing programs for all your laundry needs. The Ultra Stream Wash Washing Machine is equipped with the Auto Self Clean technology as well that effectively reduces mold and bacteria by 99% and this series is also endorsed by the Allergy UK Seal of Approval in recognition of its proven ability to effectively reduce or remove allergens. Committed to producing quality products, Hitachi confidently offers the 10 years motor warranty for this refrigerator series. Consumers can also choose the Sparkle Beat Wash Series that comes in the range of 13-16kg capacities. Understanding your cooling needs in the various scenes of your daily life, the Hitachi Scene Camera Air Sleep Air Conditioner uses Thermo and Image Cameras, the Scene Camera Twin that intelligently “sees” the locations of people and their level of activity and even considers sunny areas. It then adjusts the airflow and temperature to match slight temperature increases and decreases in room temperature for just the right level of comfort. Each of the wave-shaped Super Silent Wave Blade Indoor Fan varies the timing of each blade that cuts through the air to give you exceptionally quiet operation. The Air Sleep Sensor also watches your sleep condition throughout the night and automatically adjusts the temperature to the optimum level for the different stages of sleep to help you get a good night of sleep every night. As the Scene Camera Twin feature checks the room size and smartly adjusts cooling power to a suitable level at all times, it is energy and cost effective. In addition to that, the renowned Hitachi technology of the All DC Inverter applies the Smart Vector system to achieve top class cooling capacity up to 12,000 BTU/h and ensures reliable operation even under unstable power conditions. The combination of the All DC Inverter and Scene Camera Twin can cut energy consumption by up to 62% compared to non-inverter models. Rest easily with this series of air conditioners as it comes with a 10 years inverter compressor warranty for your peace of mind. Stay comfortable all day, all night. The Power Boost Cyclone Vacuum Cleaners are designed with Smart Head, a motorized auto drive head that features a powerful motor, made more airtight to generate high-speed air flow that enables powerful suction of dirt. It also wipes the floor while generating a powerful suction of dirt from the front, every corner from the sides and the back. Allergy causing dust mites are also found in quilts, mattresses and sofas. The Power Boost Cyclone Vacuum Cleaners is equipped with a Power Beat Head (Bed Nozzle) to beat the fabrics of these household items and get rid of the allergens for a safer and cleaner environment. Unlike the mop or broom, this Hitachi vacuum cleaner allows you to dispose accumulated dusts and debris that contains house dust mites, pollen and other microscopic allergens easily without scattering them. Do away with the conventional ways of vacuum cleaners as it comes with a one-touch operation to dispose all the dust and you can even dismantle the Washable Dust Case and wash all the parts separately with water to keep them clean. Hitachi’s cyclonic type of vacuum cleaner was also awarded the Allergy UK Seal of Approval in recognition of its proven ability to reduce exposure to allergens. Most importantly, this series has the cutting edge Nano Titanium filter for a powerful anti-bacterial and deodorizing effect that will catch and resolve odours for a cleaner home. With additional filters such as the Micro Clean Filter, Motor Filter and the HEPA (H13) Filter, you can rest in the comfort of your home knowing that the air you breathe is much cleaner. True to its hallmark history and philosophy of innovation, Hitachi continues to deliver breakthrough technology in its line of Air Purifiers. From its impressive 6-direction air inlet in 2002 to the photocatalytic-activated deodorising and its easy-maintenance Stainless Clean technology, everything has been geared towards exemplary performance. This line of Air Purifiers has a Wide and Speedy Dust Collection capability, rapidly collecting dust in just 6 minutes in a 13m² room. It is fitted with Auto Self Clean – Auto Filter Cleaning Robot, a pre-filter that is automatically cleaned before dust can accumulate. This makes maintenance even easier as the box will need to be emptied only once a year only depending on the environment in which the unit is used. Breath in the difference in the air as the Allergen-Free HEPA Filter works with the Stainless Clean System in the pre-filter, flap and net outlet to keep the air clean and hygienic as it helps to eliminate dust and bacteria. Furthermore this line of air purifier’s Washable Deodorising Filter can be washed with water to restore its deodorising power and the filter can last approximately up to 10 years. Rice is one of the staple foods of Malaysians but it’s not easy to get the different types of rice cooked just right. The Hitachi Induction Heating (IH) Rice Cooker utilizes Japan’s most advanced heating technology to produce magnetic forces that generates heat in the pot itself to yield delicious fluffy rice with just the right texture. Thanks to the made in Japan 3.6mm Thick Iron Pot, heat is transmitted uniformly to cook rice evenly and you choose from the different Rice Modes that will further ensure the best results for the type of rice that you are cooking. Cook your favorite dishes with the Easy to Use display panel and the Auto Recipe Mode as both functions allow you to choose from 40 recipes ranging from Thai, Vietnamese, Malay-Chinese and Japanese cuisines included in the water-resistant cookbook that comes with it. The IH Rice Cooker is also eco-friendly as its combination of Hitachi’s induction and inverter technology enables rapid cooking while reducing energy use. Available in Brown Gold with 14 Cooking Modes that include the Steam and Slow Cook Mode, you may find yourself cooking more often this 2016. Preparing your own bread dough is no hassle with the Auto Bakery function as you simply need to add ingredients in the Baking Pan and let it set in the oven. Your home will be filled with the sweet aroma of freshly baked bread that is soft and fluffy on the inside and filled with flavour in 90 minutes with the Convection Oven function. Enhance your culinary skills with Hitachi’s Super-heated Steam Microwave Oven. Make healthier meal choices with the Superheated Steam mode that uses over 100⁰C of steam inside the oven heater to reduce fat and salt content in your food. The Superheated Steam microwave oven can also cook food that will be crispy on the outside and juicy on the inside when you choose the Oil-free Deep-Frying mode that comes with 18 pre-set menus. Or choose to prepare nutrients filled grilled vegetables like cabbages or pumpkins with the Steam-grill mode, a unique Hitachi innovation that combines the method of cooking using a grill plate and steam lid that preserves more Vitamin C in the vegetables in comparison with those that are cooked in a conventional oven. These new products with the exception of the French Bottom Freezer Refrigerator are already available at major electrical chain stores and electrical shops throughout Malaysia. Previous : Microsoft Dynamics AX Now Available In 137 Markets!